The Passover Haggadah Graphic Novel a collaboration between acclaimed Batman comics creator and Jewish cartoonist Jordan B. “Gorf” Gorfinkel, Koren Publishers, and Israeli artist Erez Zadok. 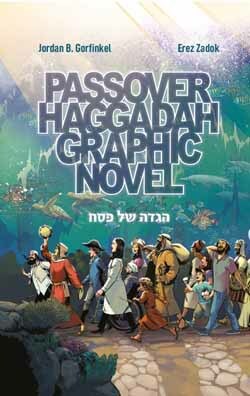 Using contemporary, vibrant illustrations, The Passover Haggadah Graphic Novel integrates a brand-new, modern translation into sophisticated and fun sequential art that brings the epic Exodus story to life. The result of extensive historical and linguistic research, every gorgeous panel imbues the classic narrative with renewed relevance and excitement.